Share the Good News is a programme that has been developed by the Irish Bishops Conference which endeavours to make the Good News of Jesus Christ more fully known and lived among people. ‘We are convinced that knowing Christ’s love for us can change our lives, convert our hearts and transform the world.’ (SGN 1)The new Irish Catechetical Directory Share the Good News was launched in the diocese of Cork and Ross in September 2011 at an event with its author Dr. Gareth Byrne, Bishop Buckley, and representatives from schools, parish faith development ministries, clergy, diocesan advisory groups and the pastoral development team. In his address Dr. Byrne focussed on the purpose of faith development as inviting people into deeper ‘communion and intimacy with Jesus Christ.’ He said that there were many ways that this was already happening, sometimes unnoticed, in the everyday life of our parishes, and that there was much more that can be done by all of us. 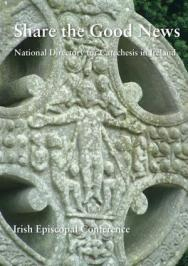 The Directory outlines a vision for faith development in Ireland in the coming ten years. It addresses how the Gospel of Jesus can be shared with adults, young people and those who are disadvantaged, and gives some practical suggestions about new structures which can be put in place.